Transport the caponata in a small, sealed container in a picnic basket. Wrap the toasts in a big napkin and put on top of the caponata. Stash the ricotta in a sealed container in a cooler. Freeze the limoncello overnight. If you have room, pack it, the syrup, and club soda in the cooler along with ice and lemon wedges. Otherwise, carry bottles separately and pour over ice at the picnic. For the cookies, use a pretty box with a lid or a vintage tin lined with tissue paper. 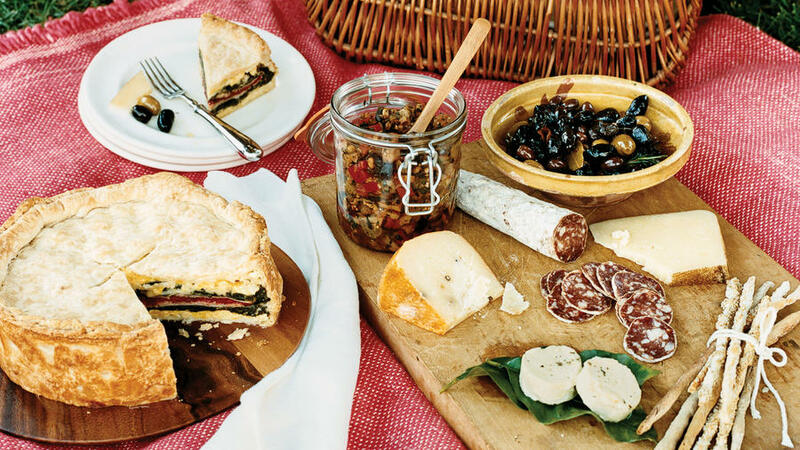 Fill out your picnic basket with a trip to the deli: Pick up some good salumi (cured meats) and Italian-style cheeses. For a well-rounded selection, choose one or two salumi, one soft and creamy cheese, and one or two firm cheeses. Below are some of our favorites from Northern California; check out what’s made in your area.